This large fireplace is flanked by two wood storage boxes. Wood storage boxes should be convenient and large enough to hold a considerable amount of fire wood. 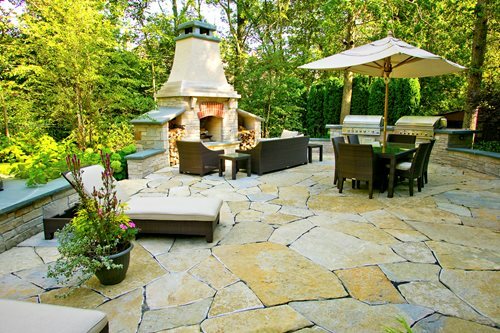 Romani Landscape Architecture in Glencoe, IL. This fireplace has a custom cabinet above that mantel that houses a built-in flat screen TV. 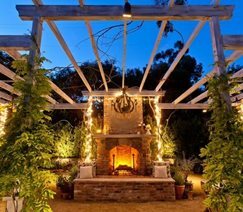 David Reed Landscape Architects in San Diego, CA. A large stone hearth provides extra seating in front of this fireplace. Cultured Stone in Toledo, OH. Soft lighting makes this fireplace stand out at night. Alastair Boase Landscape Design in Sherman Oaks, CA. Wood StorageIf you get a wood burning fireplace, you'll need a place to store wood close by. A built-in wood box is great for this purpose. You need a storage box that is large enough to hold enough wood to keep the fire fueled through the evening. However, many homeowners opt for two storage boxes on either side of the fireplace to create a symmetrical design. Another option is to build a wood storage space beneath the firebox and hearth. 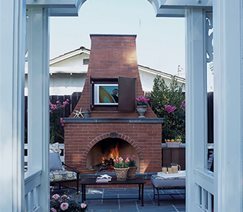 For a custom fireplace, the boxes can be built right along with the rest of the fireplace, using steel frames or concrete block. You can also buy prefab wood boxes that will work with a prefab fireplace unit. You will be able to face and cap the storage boxes to match the rest of the fireplace. Many people like the rustic look of stacked wood and therefore leave the wood boxes open; however, you can also have cabinets or doors installed. 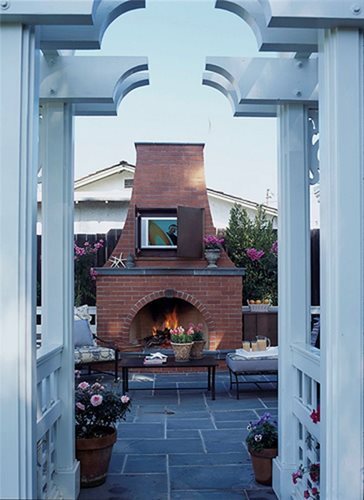 MantelFor an added boost of style you can add a mantel to your outdoor fireplace. An outdoor mantel serves a similar purpose as an indoor one—it is a feature on which you can display decorative items. Outdoor mantels can be made of precast concrete that is colored or textured to your liking. Precast concrete is an excellent option because of its outdoor durability. Other popular outdoor mantel materials include granite rock, cast limestone, and wood (if properly treated for the outdoors). Be sure to take into consideration how wide you want the mantel to be. Depending upon what type of items you plan to display, your mantel needs to be wide enough to accommodate them and to avoid anything from teetering and falling off. The size of your mantel will also add character to your fireplace. Consider using an edging that complements your style, whether that be ornate with a thick molding-like edge, or modern, with a sleek and narrow edge. HearthIf you want to be able to sit and warm up close to the flames, consider adding a hearth to your fireplace. A hearth is an attached bench that allows for people to sit close to the fire. A comfortable height for a hearth is between 18 and 20 inches. Make sure the seat of your hearth is deep enough for someone to sit at a comfortable distance from the flames. Companies that sell prefab fireplaces usually have a matching hearth option that can be attached to the main unit. If you are opting for a custom fireplace, your contractor will be able to build a hearth that suits your needs. Your hearth can be faced with brick or stone to match the rest of the fireplace. 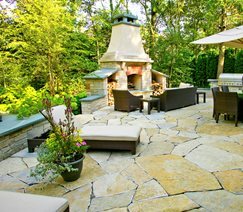 For an added decorative touch, cap the hearth seat with flagstone or precast stained concrete. 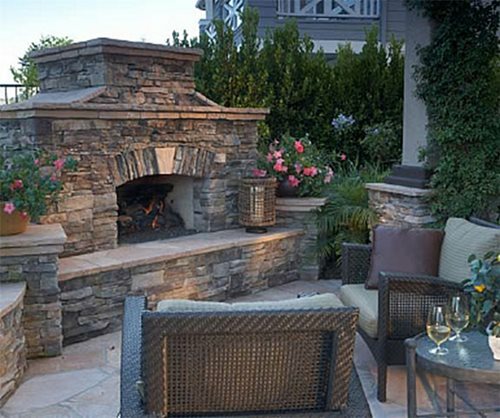 LightingLighting should also be a consideration when installing an outdoor fireplace. Make sure your lighting is subtle and doesn't overpower the glow of the fire. 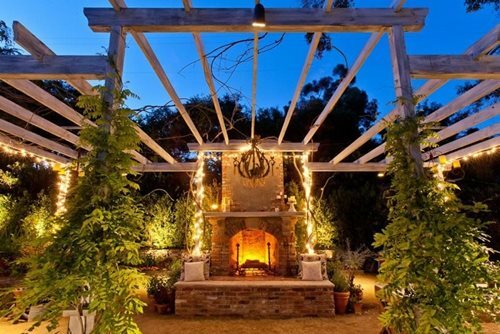 Light fixtures can be incorporated right into the structure of an outdoor fireplace. Consider using light to highlight special features such as the mantel or wood box. If you plan to install lighting on your fireplace, make sure electrical lines are ran before construction begins.